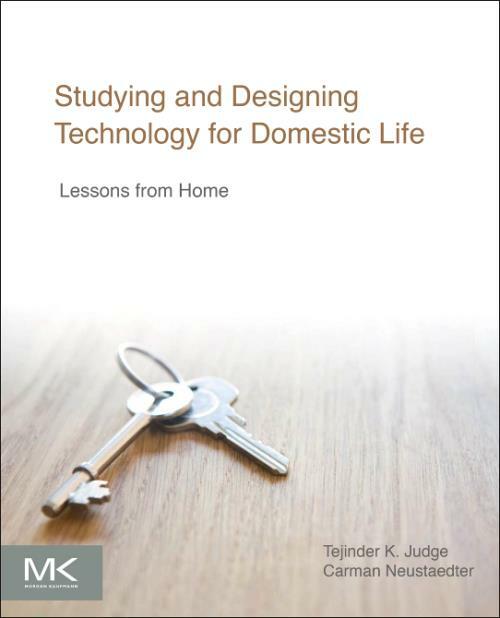 - Discover new research methods for exploring family life and evaluating and designing domestic technology.- Learn about the challenges in designing for and studying domestic life from experts in the field.- Read researchers' candid stories about what works and what does not work in practice.- More information available at the companion website: [external URL] Note: This is an On Demand product, delivery may take up to 11 working days after payment has been received. Dr. Tejinder K. Judge is a User Experience Researcher at Google Inc, and has organized and led multiple conference workshops on this topic. She is currently researching the design and use of social computing technologies to connect close ties such as family and social circles. Dr. Judge has published over thirty scholarly articles in these research areas. Dr. Carman Neustaedter is an Assistant Professor in the School of Interactive Arts and Technology at Simon Fraser University, Canada. Dr. Neustaedter specializes in the areas of human-computer interaction, domestic computing, and computer-supported collaboration. He is the director of the Connections Lab and has published a book and over seventy scholarly articles.